Denny Jump (Bellevue, WA, United States) on 5 January 2015 in Landscape & Rural. 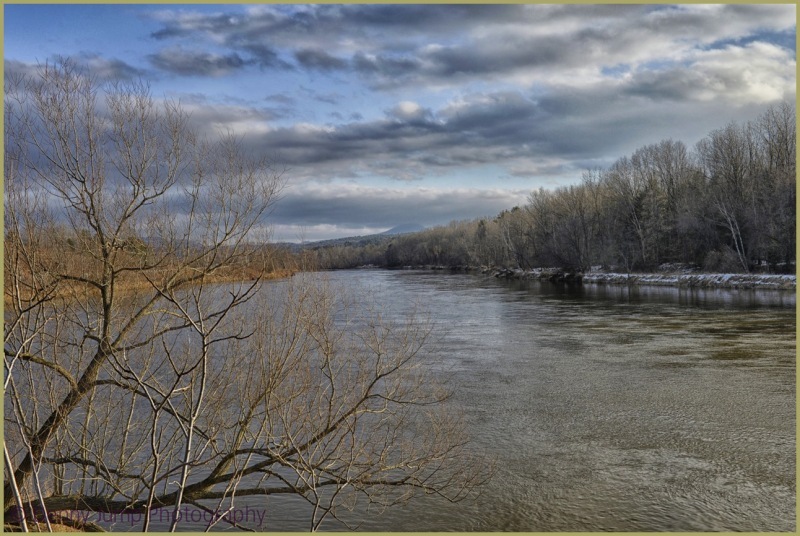 Just a short walk from our daughter's house in Vermont is the Winooski River. (Winooski is an Indian name for "Onion"). The river is just one of many beautiful scenes that we enjoy while there. This is a shot that I grabbed the day after Christmas. We had snow on the ground through Christmas Eve, but we awoke on Christmas morning to see bare ground, thanks to a "warm" rainstorm that passed through on Christmas Eve. Behind the distant clouds are some beautiful peaks of the Green Mountains, but the clouds did not cooperate on this particular photo shoot. I hope that your New Year was pleasurable and I wish everyone a wonderful 2015.
wonderful compo and frame, superb treatment that brings out the beauty of nature in all its aspects, especially the dramatic cloudscape! all the best, denny !!! wish i was there fishing . Pretty shot of this big river. Still a little snow on the river bank. A wonderful winter scene Denny! It looks cold! I love the sky!